The long lasting aluminum and stainless steel air filters will maintain their initial efficiency with periodic applications of the Super Filter Coat after a cleaning. It helps trap dirt, dust and pollen, includes built-in detergent to aid in cleaning and improves the effectiveness of other filters. 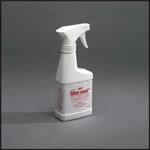 10 ounce plastic container spray bottle.